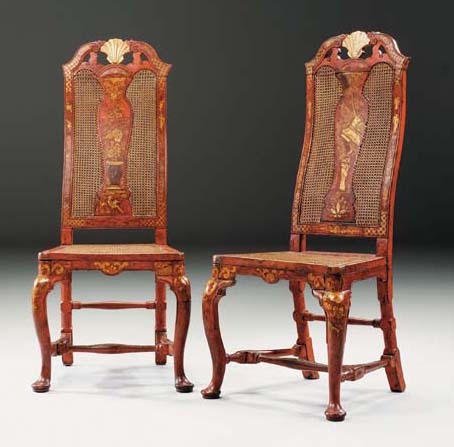 This pair of richly-japanned side chairs are conceived in a similar manner to the renowned set of over 70 pieces of japanned furniture purchased from the Clerkenwell cabinet-maker Giles Grendey, by the Duque de Mendoza-Infantado in about 1738 for his castle at Lazcano, northern Spain. Many idiosyncracies found on the Lazcano set appear on the present pair which confirm that they were made for export. First, the scarlet and gilt-japanned surface which appealed to the Spanish love of exuberant decoration. Second, the shape of the chair is stylistically that of a Queen Anne chair: while the architects, designers and cabinet-makers in England in the 1730s and 40s were responding to the classicizing influence of William Kent and Inigo Jones, Spain, by contrast, appears to have resisted these changes and the English style of the early 18th Century remained popular in Spain. Third, the high cabriole leg, use of stretchers and caned seat are all physical features of native Spanish chairs of this date: the stretchers being used to strengthen the beech frames (C. Gilbert, 'Furniture by Giles Grendey for the Spanish Trade', Antiques, XCIX, 1971, pp. 544-50). Many chairs labelled or attributed to Grendey bear two-letter marks, as in the present case. The mark 'WG' is unrecorded, but 'IC' is recorded on a pair of chairs sold from the collection of the late J.S. Phipps, Sotheby's New York, 20-21 November 1981, lot 233. They may refer to apprentices in Grendey's workshop. A related pair with slightly more elaborate crestings was sold from The Prescott Collection, Christie's New York, 31 January 1981, lot 349. A further related set of six chairs, attributed to Grendey, were illustrated in Partridge Summer Exhibition, 1988, no. 10, pp. 30-32.